Preschool teacher teaching her children about geography. Using globe and asking the questions. Children answering the questions. Children sitting by the table. Selective focus to girl in the middle. Models in this shot are part of real kindergarten group and their teacher. According to new research from Stanford psychologists, children as young as four can recognize “sins of omission” (Courtesy of Stanford News). Technically correct but misleading statements are called “sins of omission,” researchers say. For example, saying, “I got my test back,” but neglecting to mention the test’s failing grade would be a sin of omission. The statement would be technically correct but not offer the entire truth. “Because omission can either be useful or misleading depending on the context, parents and educators should be mindful of children’s sensitivity to ‘informativeness’ and understand when omitting information is helpful and when it can be a ‘sin,’” lead author and assistant professor of psychology Hyowon Gweon told Stanford News. “Most studies on children’s understanding of informativeness have focused on whether children recognize people who provide incorrect or false information, and here we were interested in children’s sensitivity to a more subtle form of misinformation,” Gweon added to The Daily. Gweon explained that the study was meant to assess children’s ability to detect that difference between a sin of omission and an outright lie. “It is critical for young learners to recognize and evaluate others as informants to decide whom to approach and trust for information,” Gweon wrote in the study. The researchers ran four experiments, beginning with children aged six and seven and ending with children aged four and five. Participants learned about two toys: one with four functions, and the other with just one function. They then viewed videos in which “puppet teachers” demonstrated those functions to Elmo, the beloved character from Sesame Street. However, each puppet teacher demonstrated only one function to Elmo, thus making the teacher that showed the sole function of the single-function toy fully informative and the other — who demonstrated only one of four possible functions — an under-informative teacher. The participants watched a video one at a time before rating the puppet teachers based on how much they helped Elmo. For the six- and seven-year-olds, the order in which they watched the videos did not affect the results. 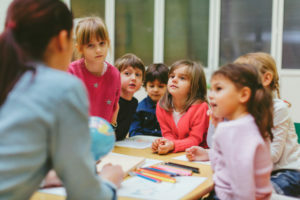 But order mattered for the four- and five-year-olds; they only noticed the sins of omission committed by the under-informative teacher when the video of the informative teacher was shown first. Gweon wrote in the study that, for younger children, “prior experience with a fully informative teacher is critical for successfully evaluating an underinformative teacher,” because children at that age still lack the sensitivity necessary to detect sins of omission. Gweon also emphasized that children must first know what knowledge is correct in order to detect omission: “One moral here is that as listeners and learners, or evaluators of news sources, we need to be knowledgeable,” she said. The study also discussed possible reasons for the marked disparity between children of different ages. “One explanation is that experience with formal schooling experience helps children… understand that the most relevant and defining property of helpful pedagogy is informativeness,” Gweon wrote. The findings in her study are related closely to pragmatics, a branch of linguistics that explores the use of language in social context. Gweon hopes her work will bring the two fields closer together. Gweon explained to The Daily that she hopes to investigate whether young children can tell when someone is giving them excessive information. Contact Veronica Kim at vkin70 ‘at’ stanford.edu.